3 primary color transparent pigments. Old Holland Indian Yellow O/s PY153, the same hue as dual-tone orange/yellow Transparent Tartrazine PY100 Clear. For watercolor and inks only, a warm orange to yellow pigment by Spectra Colors, a manufacturing pigment supplier in N.J.
We paint one of these color wheels in each class I give. 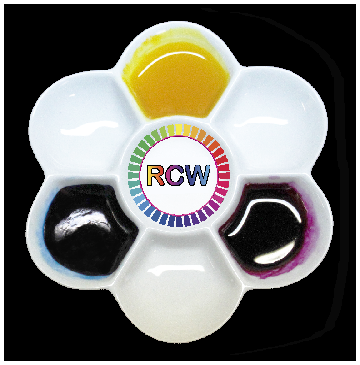 1-15-5, This RCW is painted with acrylic paint. There is no transparent PY153 at this time in tubed acrylic paint so I made one from a nickel complex dry pigment from Zecchi Fresco Supplies in Florence called Indian yellow, they restore ancient murals. 4-29-9, Today many synthetic Indian yellows are available. 10-18-10, No commercial paint manufacturing company uses Tartrazine Indian yellow to orange-brown for their Indian yellow water-color paint yet. I print my colorwheels and painting giclees with it. Tartrazine transparent is great as a water color paint. Old Holland's Classic Acrylics - New Masters, use a PY3 translucent mono-colored-cadmium yellow hue called Azo. Cooler than the opaque cadmium yellow PY:35. They have four mono-toned pigments from translucent to transparent plus two dual-toned acrylic colors. The color is close to original arsenic yellow. Yellow-Green-Oxide hue to Yellow, PY:153 Org/s Dioxine Nickel Complex w/ PY:129 Azo methine copper complex is Indian Yellow-Green Lake Extra OH oil. Yellow-Brown-Oxide hue to Yellow, PY:150 Brw/s Dioxine Nickel Complex, acry. (Zecchi Syn. Indian Yellow) dry pigment, Indian Yellow Brown Lake Extra OH oil. Red-Orange to Yellow, PY:153 Org/s Dioxine Nickel Complex w/ PY:10 Isoindolin (Indian Yellow-Orange Lake Extra OH). Isoindolinone and Isoindoline and Iron Oxide are not dual-toned by themselves. Green-Orange hue to Yellow-Green, PY:129 Azo methine copper complex, Old Holland Green Gold. msg= Hi Don, Send me a Zip of the RCW please. 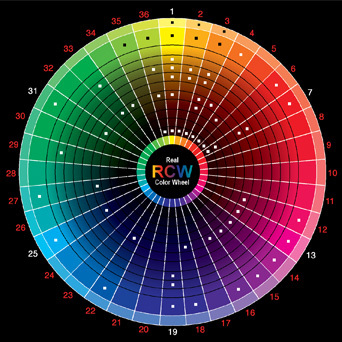 Yours is the first really useful colour wheel that I have found as it is good for photography as well as for paint. I'd like the zip so that it can be printed to A3 size for use as a teaching aid in a photography course in the UK. Subject: RE: Join my network on LinkedIn, I joined you. Hooray! My 30 grams of Sennelier's Quinacridone Red, #679, for $55 w/ship arrived. IT IS THE PERFECT TRANSPARENT MAGENTA, BAR NONE. It's Pigment Index Color Number is PR122. This is the dry pigment magenta you need for frescos and all other media. I hate it when I run out. Or (for water colors) Transparent Tartrazine PY100 Clear (warm yellow-orange) by Spectra Colors. Transparent Phthalocyanine Blue (cyan) PB15.3. Keep this list as close to your heart as I do, it took testing over $2000 worth of pigments to find these gems. At the same time I got a great fresco complete palette. I made a DVD of painting 2 frescos using the transparent primary palette. It's $35 on my order page. 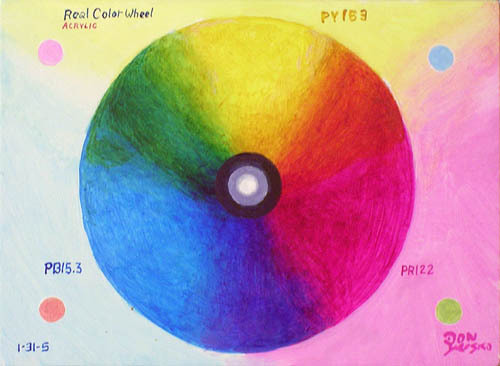 Painting with a Transparent Triad Palette, 3 primary colors, makes all these colors except one ultramarine blue ball which was used to compare the mixed blue with the tube ult blue PB29. 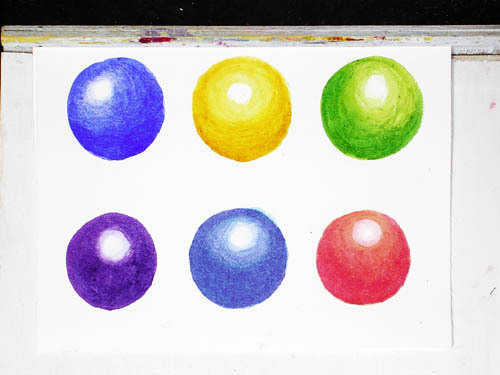 Transparent Triad Colors in 6 round color chips, except for the first ball, opaque ultramarine blue PB29. Indian yellow Org/s ball PY153. Cyan PB15.3 and Indian yellow PY153 make the green color chip sample. 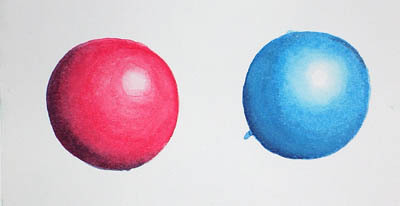 Magenta and cyan made the purple ball, cyan and magenta made the blue ball, Indian yellow and magenta made the red ball. Oppositions, opaque red PR88 or cad red PR108, transparent cyan PB15.3. Using each other's color to make a neutral dark shadow color. Oppositions Transparent Magenta PR122, Transparent Green PG35, using each other's color to make a neutral dark shadow color. The black ball was made with this transparent triad. making a very dark buon fresco without black pigment. Painting an apple with my transparent 3 primary color sample card. PR122, PB15.3 and PY153 in water colors, laying down yellow first, than magenta and cyan. 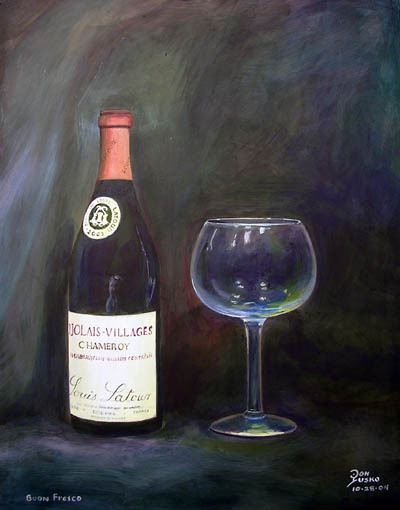 This was painted in 2000, the paper is the palette. I have my own w/c Indian yellow now for pigment and ink, it's a clear transparent yellow. This cool 3 color primary transparent triad in oils made perfect blues, reds and greens. Bocour Cobalt Violet, color not available anymore, it was cooler than PR122 but it bled. I think it was the first true magenta. Indian yellow PY153 from Zecchi, Transparent Tartrazine PY100 w/c by Spectra Colors. Old Holland Indian Yellow Orange-side and Old Holland Indian Yellow Brown-side, both make the same cadmium yellow hue when tinted or thinned out. Daniel Smith New Gamboge PY153 (or Golden PY150) Nickel Dioxine is the best Indian Yellow O/s oil pigment. PY100 transparent Tartrazine yellow O/s for watercolors. Daniel Smith Quinacridone Magenta PV202 is more to the cyan side so it's not perfect for my colorwheel. Grumbacher Thalo Crimson PV19 is more to the warm side so it's not perfect for making blues. PR122 is the perfect magenta. Also perfect is ShinHan Opera PR122 + BV10, which has a mass-tone lighter tinted hue of magenta that still mixes with Thalo Green PG37 to mix a neutral dark. They are two different hues of the same magenta color. ShinHan Bright Rose is also a very close match for plotter/inkjet ink magenta, Original Equipment Manufacture (OEM) magenta color. Grumbacher Thalo Blue PB15 is the perfect transparent cyan primary color to mix and make any color in front of me as I paint oil or any media. Golden Acrylics, Indian Yellow Hue golden/side transparent. Nickel Complex Azo PY150, with Quinacridone PR206 and Arylide yellow PY73. and Brown/side Golden Acrylic Nickel Complex Azo PY150. None of them make a pure yellow. Children painting with Food Coloring Colors First Grade learning the transparent 3 primary colors. Children painting with Pre-made Water Colors Third Grade learning the transparent 3 primary colors 2010. Adult artist workshop 1 on Maui Adults using only the primary colors. Adult artist workshop 2 on Maui Adult pros making and using only the primary colors. Lime Water Medium buon fresco #1 in 3 colors. Lime Water Medium buon fresco #2 in 3 colors. Maroger Medium Hana Paintings with Maroger's Medium in 3 primary colors. Maroger Medium The Kaupo Hearts, Black Oil painting in 3 primary colors. Egg Tempera Medium Still Life with the transparent 3 primary colors. I have been working with a chemical company called Spectra Colors Corp. in my home State, N.J., 4-2-6, to provide my clear transparent yellow color. PY100, Spectracid Tartrazine 170 / Acid Yellow 23 / Azo / C.A.S#: 1934.21.0 / H:1 F:0 R:0 P:D / APR 25,2006 / Lot # T14976 / Scc Order # : 63305, is my choice. This is it, a clear Indian Yellow for plotters and w/c artists. It is very permanent, never changing at all after 2 months in the hot Lahaina Sun, the ball point writing is gone. 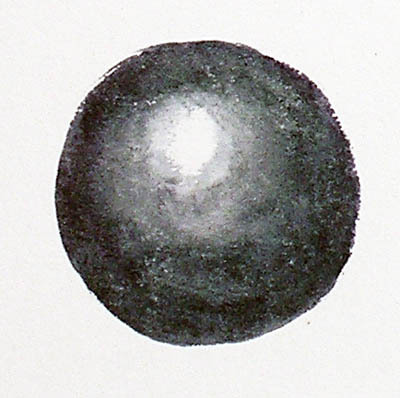 Ethylene Glycol added to the pigment made it waterproof ink when dry. To use this pigment as a water-color add gum arabic and a little honey. The amount of water added to the pigment to print a cadmium yellow light is 1:9. In this image there is 1 cup of the 1:9 mixture, the pigment and dilution I'm printing with is 1:29. 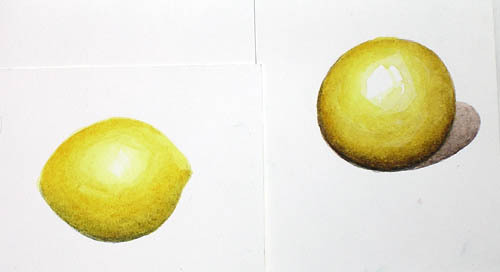 Printing with full strength (1:1 with water) the ink printed a cadmium yellow medium hue color. 1:29 is what the plotter needs to bring it down to cad yellow light hue. All colors with yellow included in them are rich. The yellow ink for printers/plotters is opaque today, and I found it prints weakly as a tint. Yes, the plotter spray printing industry can use an upgrade.. Their standard Cyan is too magenta (I think), so could our National Color Index, it's lacking because it's based on calling red, yellow and blue the primary colors. Imagine saying red (which is made of yellow and magenta), is the primary color and giving magenta a code like PR:122. That's Pigment Red #122 to the artist trade. We all know that's wrong. Or should know it's wrong. 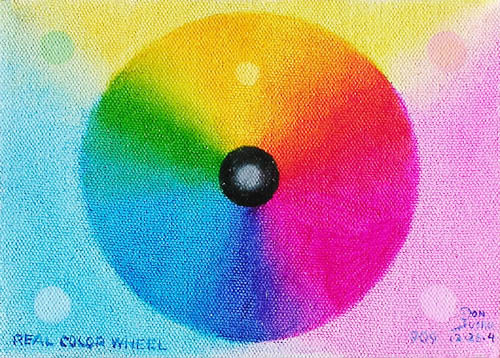 not the red, yellow, blue colour wheel. My color wheel adds to that, giving the ability to mix all opposite secondary colors to a neutral black hue or shade colors. This is a big problem today, because all of our State's School Standards are commanded to teaching the Red, Yellow and Blue as primary colors. Very sad. 11-20-8, The day before yesterday I ran out of the color MediaStreet calls G-7 cyan in my plotter. I have two bottles on hand so it was no problem. Instead of just refilling my homemade bulk ink system I decided now was the time to work on my Spectra cyan. Spectra had sent me cyan in two forms, dry pigment and liquid. This is how I tested and compared the different products. An eye dropper will give equal amounts per drop if the viscosity is the same. For each color ink I made a chip color of 1 ink to 0 water = 1:0, the full ink color. And 1:1, 1:2, 1:3, 1:4, 1:5, 1:6 all the way up to 1:24. Spectramine Blue FBLK LIQ, Direct Blue 199 is the only color matching the Grumbacher Thalo blue oil paint that I love and promote. Spectra Colors Corp. is a pigment manufacturer. They make that transparent color in dry pigment and water ink concentrate. As far as the different ink colors for different plotters is concerned, this is what I found. MediaStreet G-6 cyan for the 4 and 6 color plotters reaches the same value by diluting the Specta "cyan" like this, 1 Spectra (cyan) : 2 water : 1/4 ethylene glycol. I use the addition of ethylene glycol as a slower drying lubricant for my plotter's heads. TIP: For cleaning purposes, ammonia dissolves dried ink, it breaks it up which is good for cleaning printing heads. Alcohol is not good for cleaning heads. This final color was still too dark for print my opinion. The cyan it prints on my color wheel looks too blue. Remember, cyan changes to blue as it gets darker. For my plotter I settled on 2:5:1/2, two spectra liquid, five water and 1/2 ethylene glycol.